OrthOracle is delighted that it will be able to provide its worldwide readers with more complimentary educational hip surgery content, in conjunction with MicroPort, during 2018/19. The company is pleased to be able to make this announcement during an important week for hip surgery education, with Bristol Hip kicking off on 15 November. MicroPort UK Head of Marketing Nathan English agreed, adding, “It has been great to partner up with OrthOracle, as we see it as a great addition to our internal medical education events. At MicroPort, our priority isn’t just to help surgeons get patients back on their feet — we want to help patients get back to full function, faster. MicroPort will be on site at Bristol Hip, where learners can find out more about SuperPath. You can also visit their website or Joint Academy Microport™. 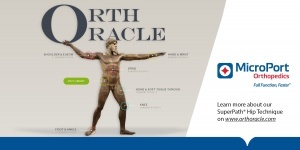 For all the details of SuperPath® Hip Technique, go to OrthOracle’s CPD-accredited module here.